Graphite is making headlines and creating significant market interest largely on the back of its integral part of lithium ion batteries in electric cars. The world is shifting to electric cars at a quick pace, driven by the likes of Tesla and traditional car makers fast realising that the game has changed. Beyond just electric cars, lithium ion batteries are expected to feature prominently in the next wave of consumer products such as mobile phones, laptops, power tools, and medical devices. What this means is a rise in demand for graphite given its use as anode material in lithium ion batteries – and therein lies the opportunity for investors. It is no wonder then that small cap explorers are jumping into the fray – we have seen many mining juniors launch very successful and high growth graphite exploration campaigns on both the TSX and the ASX – but strangely this buzz has not fully arrived on the AIM – yet. 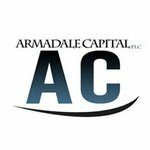 Armadale Capital (LSE:ACP), a resources investment company currently building a strong commodities portfolio in Africa, is one of the few AIM listed companies out there with its hands on potentially high value graphite ground, in an emerging exploration hot spot. 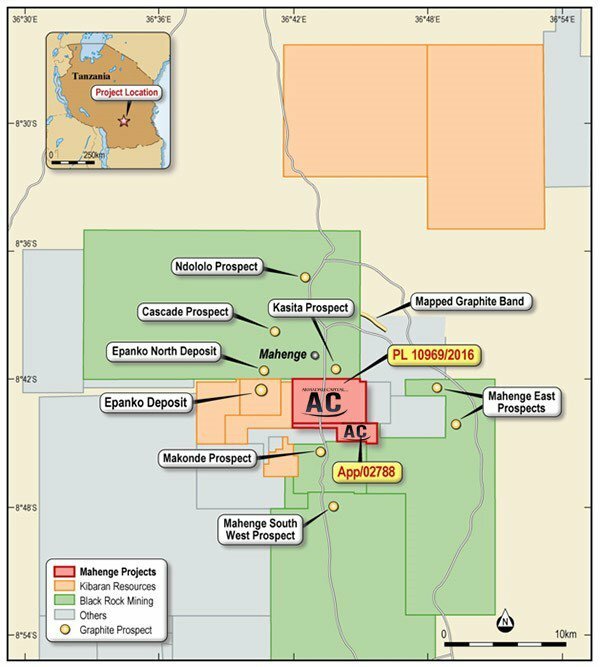 ACP is set to add the Mahenge Liandu Graphite Project in Tanzania to its portfolio via a recent heads of terms agreement struck with the project vendors. The important thing to note here for ACP and its shareholders is that the Project is located right next door to emerging ASX listed graphite explorers Kibaran Resources (ASX:KNL) and Black Rock Mining (ASX:BKT), both valued at multiples of ACP’s current market cap. Both Kibaran Resources A$41.1M (£20.29MN) and Black Rock Mining A$13.97 (£6.9MN) now have grown significantly on the back of their graphite projects surrounding ACP’s new project. Kibaran has bagged binding offtake agreements to the tune of 30,000 tpa, including 20,000 tpa with ThyssenKrupp – the €11.18BN multi-national conglomerate – validating the quality of the graphite in these parts. ACP represents a compelling graphite opportunity for the small-cap UK investor, currently capped at just £1.43M. The Aussie explorers around ACP confirm that there is a growing market for graphite coming online, and if you can strike some significant graphite mineralisation, things can move very fast. ...and ACP is an early mover defining this changing trend on the AIM market. If a host of tiny Aussie companies can get their hands on quality graphite tenements in Africa, and raise their valuations on the back of the lithium battery revolution, can Armadale Capital (LSE:ACP) repeat the form in the UK? We certainly think so given the impressive tenement package ACP has snagged, and the positive initial results already seen. ACP is right next door to its higher valued Aussie counterparts Black Rock and Kibaran, and within the same geologic units. Take a look at the map below, for further evidence of just how close they are. We will look at the map in more detail further down, but given the company’s position set amongst a hive of exploration, and of course its tiny market cap, with ACP, we think we’ve found a strong candidate to become a significant UK-based graphite starlet over the coming years, and emulate its Australian small-cap cousins in the meantime. Of course, it is early days here, due diligence between the project vendors and ACP is underway now, and ACP will likely need to raise some funds to progress with exploration. But when that exploration has the potential to transform the company to a market cap of multiples of where it is today, especially if it can go and define a significant graphite resource, it makes this stock a compelling proposition. Lithium-ion batteries gobble up incredibly high amounts of lithium, graphite and cobalt – its three key ingredients – and given the anticipated mass adoption of electric cars, there has been significant pressure placed on supply chains for these materials. Demand for graphite for use in lithium batteries, is set to go through a significant upscale between now and 2020 that will see battery manufacturers offtake 250,000 tonnes per annum (tpa) by 2020 — compared to 80,000 tpa today. That’s an increase of over 200% over the next four years. 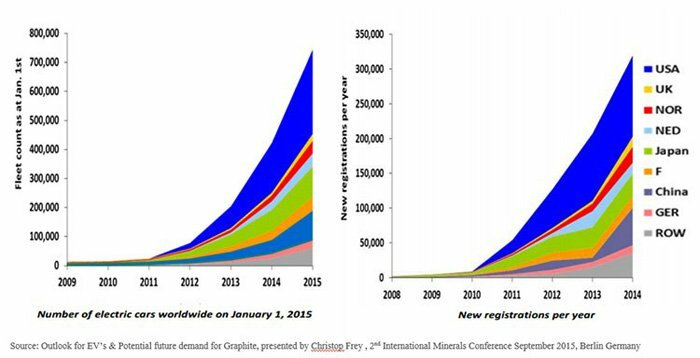 Are we seeing the initial sparks of a graphite market boom on the AIM? 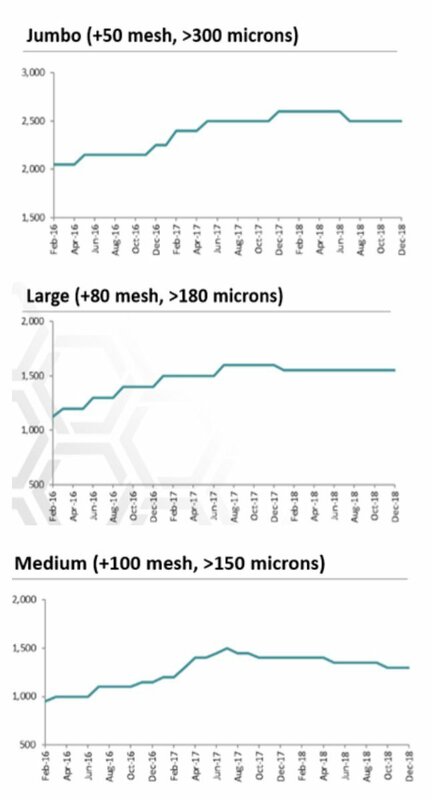 Graphite prices have perked up, although it is still too early to tell exactly what kind of specifications most graphite end-users will be looking for – what we do know for sure, is that the world is going to need a lot of it, and a number of offtake deals for African graphite have already been sealed. In terms of company valuations, graphite explorers on the ASX and the TSX that have defined significant graphite resources have been trending upwards for the past 12 months or so, on the back of greater investor awareness of this impending commodity sea change. But if we take a look at Commodities Central — otherwise known as Australia — it would seem graphite is getting significant traction. 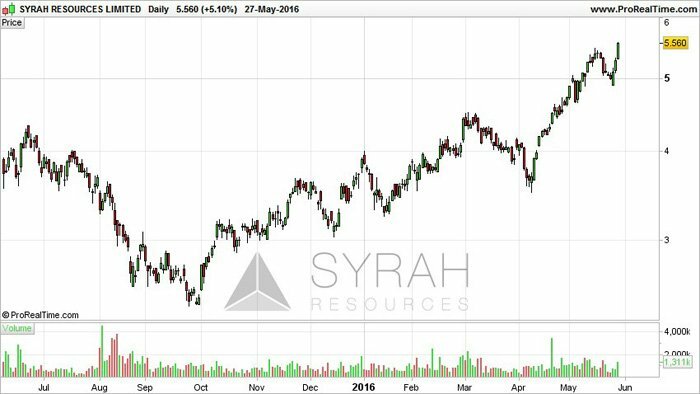 Syrah is Australia’s largest graphite explorer currently valued at A$1.25BN (£612MN). Syrah’s story began with humble beginnings via the acquisition of the Balama Project in Mozambique in 2011. Since then, Syrah has made one of the world’s major graphite discoveries, diligently progressed exploration and published a completed Definitive Feasibility Study (DFS) last year. This is the type of progress ACP is hoping to emulate in Mozambique’s next door neighbour Tanzania, with the added bonus that ACP still has its Congolese Gold Project waiting in the wings just as gold prices have started inching their way north again. Whilst a Syrah like valuation is a long way off, ACP’s neighbours point the way for what could be in store for this stock in the short term. ACP’s neighbours such as Kibaran Resources (ASX:KNL) and Black Rock Mining (ASX:BKT) now have significant market caps from where they started being A$41.1M (£20.29MN) and A$13.97 (£6.9MN) respectively. Kibaran recently announced it had executed an off-take agreement with one of the world’s leading commodity trading companies ThyssenKrupp, for an exclusive long-term commercial agreement between the parties for the sale of a minimum 20,000 tonnes per annum of refractory grade natural flake graphite in Europe, Turkey, Russia, Ukraine and Korea. Remember ACP is currently capped less than £2M (at the time of writing). Here at The Next Small Cap , it’s in our DNA to keep our antennae trained for small undervalued companies such as ACP who may have a rather bright future, especially considering its position. 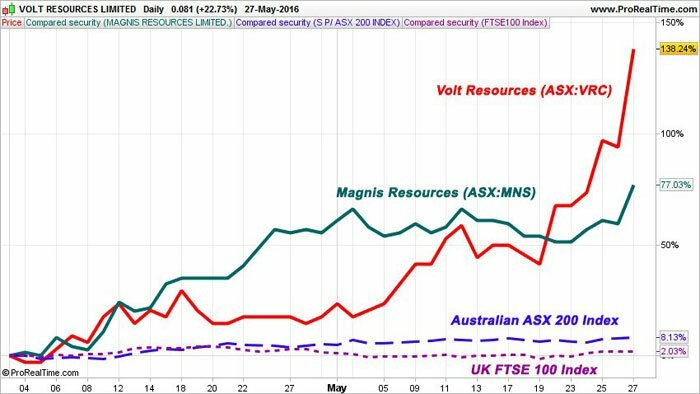 To give you an idea of how quickly graphite stocks can grow, take a look at Volt Resources (ASX:VRC) – we have been telling our readers about VRC since February 2015 when it was trading under the ticker code ASX:MOZ and was capped at a similar level to ACP’s current value. Back when we first wrote about VRC, it was in the very early stages of project development, with a very small market cap. ACP have a hold on something very similar in a similar early stage – and we see striking similarities between ACP and where VRC was 18 months ago. Of course, ACP will need to fire up the drill rig in the near term in an effort to try and hit some of the mineralisation that has caused ASX:BKT and ASX:KBN’s market caps to stir, and we will find out a whole lot more over the coming months. Suffice to say, this is still an early stage play and caution is required if considering this stock for your portfolio. East Africa has more graphite locked up under its ground, than the rest of the world combined. Zooming further in, here is where ACP will be exploring – the Mahenge Liandu Project, which consists of 2 tenements covering 29.9 km2, adjacent to the town of Mahenge. As you can see above, ACP has snagged prime real-estate right in the middle of existing graphite projects that have completed advanced studies: a Bankable Feasibility Study, plus offtake agreements in place for Kibaran (the orange ground on the map), whilst Black Rock has completed a positive Scoping Study (the green shaded areas). As we have indicated, one of the major plus points for ACP’s newly acquired tenements is their close proximity to existing (and defined) graphite resources in the vicinity. 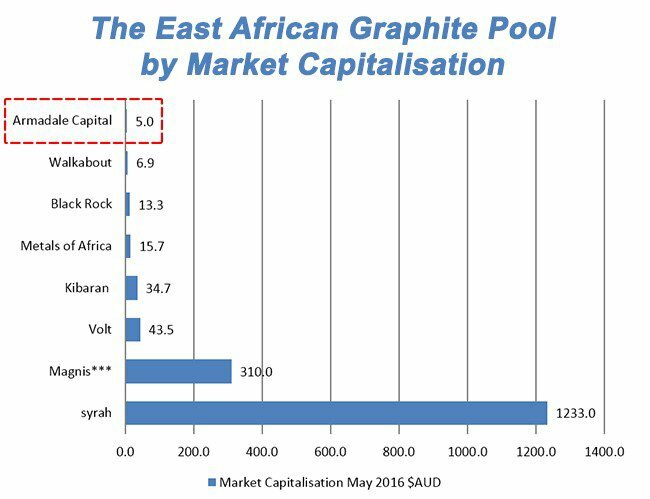 And here’s the entire East African hoard of graphite explorers, compared by market cap. As you can see, ACP is the equivalent of a tadpole swimming with whales in the form of Syrah and Magnis. Note, ACP’s market cap shown above is actually bigger than the current value, which at the time of writing is actually around the $2.55M AUD mark. For small-cap investors, ACP represents an early-stage stock packed with potential and the real possibility of walking the African graphite development path already carved out by its peers. ACP’s tenements are surrounded by over 150 million tonnes of “JORC’d” graphite resources which raises hopes of ACP’s exploration eventually defining a strong resource in the hundreds of millions of tonnes – and that would result in a rather large share price appreciation. Of course, exploration hasn’t begun in earnest yet, so caution is advised when making an investment, please consider your own personal circumstances and risk profile. Volt Resources (ASX:VRC) first started its graphite hunt in Mozambique, before moving to Tanzania last year. A larger player in Tanzania is the fully diluted $337MN-capped MNS which is slightly further ahead in its development than the rest of its peers. 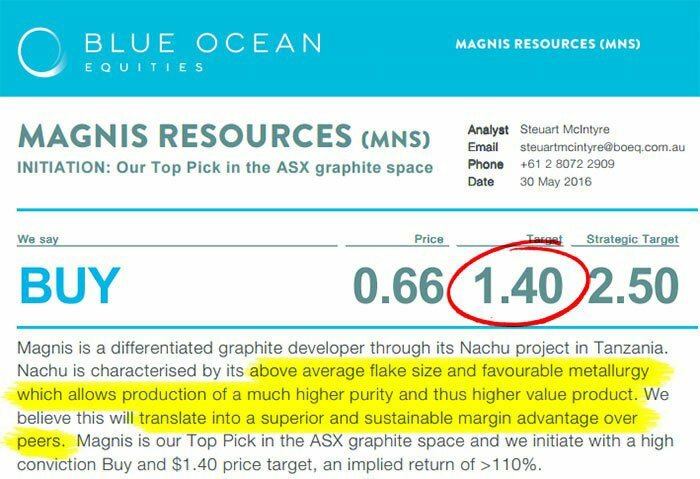 Indicating how the path to successful graphite mining goes, Blue Ocean analyst Steuart [sic] McIntyre, sees MNS pushing on from its current price of $0.78 per share, up to as high as $1.40 — that’s a gain of almost 80% from its current A$312M (£156M) market cap. In the report, Mr. McIntyre cites “above average flake size” and “favourable metallurgy” as the two standout factors that could deliver superior margins and performance. ACP is exploring in East Africa – which is synonymous with jumbo flake and natural graphite that can compete with its artificial rival, but at lower prices. MNS is looking to move into production over the next 12-18 months and is anticipating strong margins by producing high-grade natural graphite — whilst early days, ACP would hope to do something similar in the not too distant future. Despite just announcing its intention of acquiring the Liandu graphite project, ACP already has some historical drill data to play with. Reconnaissance mapping done late last year defined a mineralized trend >1.5 km in strike length and up to 500m in width. From this initial mapping, ACP has been able to obtain some initial drill hole data as an indicator of future potential. Three RC drill holes drilled late last year by the previous vendors showed intercepts of 24m @ 12.9% TGC, 5m @ 21.5% TGC and 10m @ 6.54% TGC. ACP’s next step is to initiate a comprehensive work program at Liandu, set to kick off in July; including mapping, trenching, RC drilling, DD drilling, metallurgical test work, and resource estimation – so there should be plenty of news flow for this stock in the near term. As assay results come in, ACP could see its valuation rise as long as the TGC grades are sufficiently high and the mineralisation extends. On the flip side, if its exploration results are deemed insufficient, ACP’s valuation could fall, so seek professional advice when seeking further information about this stock. It’s all part and parcel of commodities investing, and it’s why we would recommend all potential investors to do their own research if considering this stock. One of the most exciting times for any Resources company is the build-up to, and publication of its official JORC Resource. To give you an idea, Black Rock Mining, ACP’s much higher valued neighbour, defined 80% of its resource in just 8 months. ACP hopes to prove up a JORC Resource in early 2017 which it can then use to secure offtake agreements, institutional funding and possibly a joint-venture partner depending on the Project specifics. ...but in less than 12months, we could see a JORC Resource at Liandu thereby helping to revalue ACP significantly. With fast moving times ahead for ACP in the graphite stakes, one could be forgiven for forgetting that this investment company also has an existing JORC’d gold resource that’s on the cusp of entering production. We are of course talking about the Mpokoto Gold Project in the DRC, and the company is currently awaiting a $20M USD funding package to be finalised. Let’s take a quick whiz through ACP’s Congolese asset, as this project also has significant upside potential for later this year. Recent auger drilling and qualitative sampling of 150 auger holes at Mpokoto shows extensions to previously identified mineralisation, to both the north-west and south-east. This tidy bit of news means ACP’s resource at Mpokoto can grow even larger once ACP does more fieldwork. 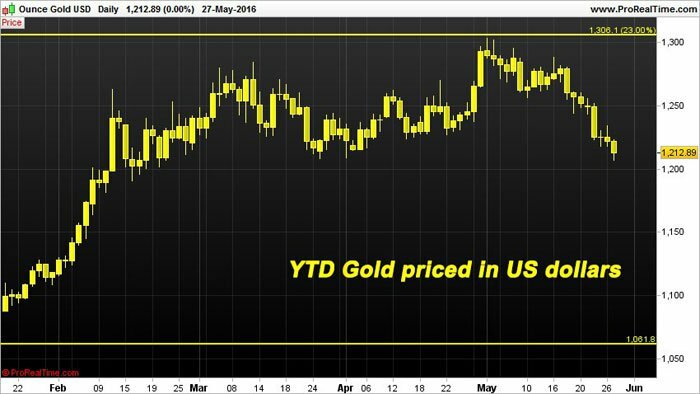 Since the start of the year (YTD), spot gold prices have risen as high as $1,306/oz., a gain of 23% since January. 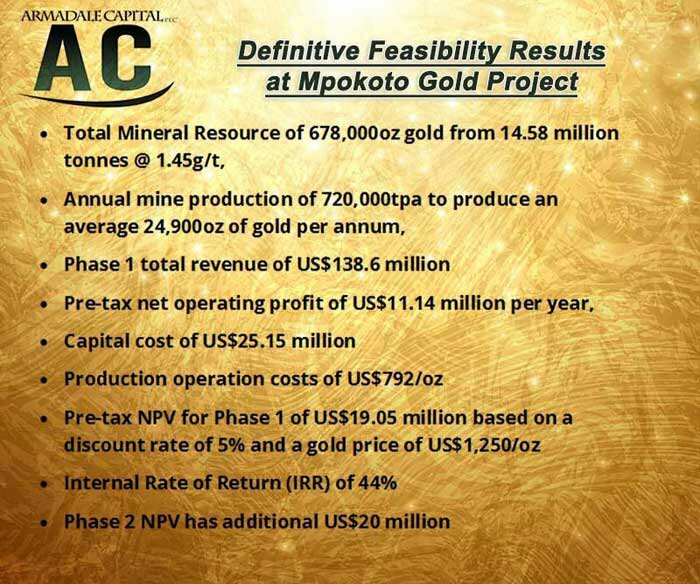 The higher gold price goes, the more economically viable ACP’s Mpokoto Project becomes without ACP lifting a finger. ACP’s Feasibility study assumes a gold price of $1,250/oz., but has an expected production cost of $792/oz. So despite gold suffering from a stronger US dollar since 2013, the good news is that ACP can remain competitive even at the lowest gold price we’ve seen since 2013 ($1,046/oz.). The only outstanding issue is the US$20MN required to construct the necessary infrastructure at Mpokoto which ACP hopes to do imminently after the necessary vis-à-vis due diligence is done between ACP and development partner A-MCS . Key components of the capital cost include US$8.25 million for the processing plant, US$3.75 million for associated infrastructure and US$8.5 million for other infrastructure. The US$20 million to be invested in ACP by A-MCS includes financing provisions to fund the processing plant as well as a mining contract to govern provision of mining services moving forward. In total, ACP has 4 mining licenses valid for 30 years which means ACP could see even further exploration upside at the Mpokoto Project. ACP’s exploration target is 2.4-3.0 million tonnes grading 1.25-1.5 g/t Au, according to the company. ACP also estimates this should yield an additional 120,000-150,000 oz. to the 225,000oz already earmarked. With its priorities now squarely in focus, ACP is on the right track. 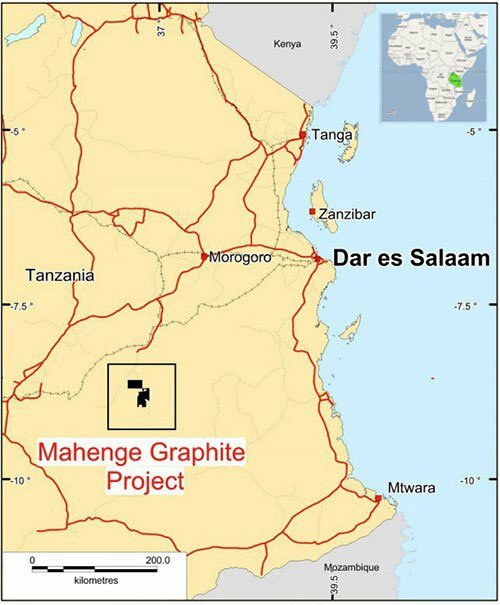 Gold from the Congo is in its grasp, while its newly acquired graphite project in Tanzania has all the early signs of being a strong high-value asset. ACP has a diversification mantra built into its operations which should give investors some comfort considering the operational space is Africa — which does carry additional risk compared to more stable parts of the world. Furthermore, ACP can take heart from seeing lots of plucky Australian explorers, previously of a similar size to ACP, progress their graphite projects to much higher valuations over the course of the last 12-18 months. With virtually no early stage graphite projects being considered by currently listed AIM companies and given ACP’s latest acquisition, the stock could prove to be rather undervalued at current levels. It’s worth remembering that the band of Aussie explorers including Volt, Magnis, Kibaran and Black Rock, have all achieved substantial re-ratings as progress towards production was demonstrated to investors. ACP could be a good stock to leverage the impending graphite/graphene revolution that’s already seen several explorers reach multi-hundred million dollar valuations without a single gram of production. Can the graphite hype make an antipodean shift over to the UK? We think there is a strong chance. It would seem those that take early positions could be the first to reap the commercial benefits once graphite begins to be sold in bulk to audacious lithium-battery manufacturers.